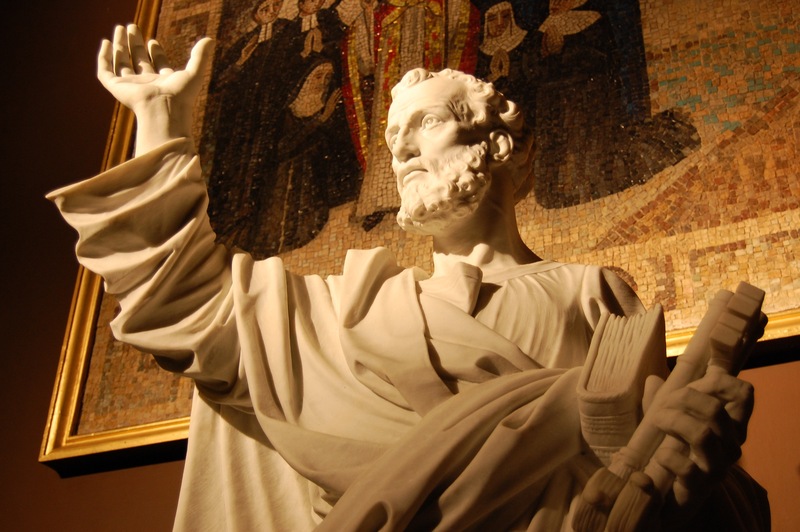 It’s the Solemnity of Peter and Paul, June 29th, a feast day of the highest magnitude at the Cathedral Basilica of Saints Peter and Paul in Philadelphia, Pennsylvania. 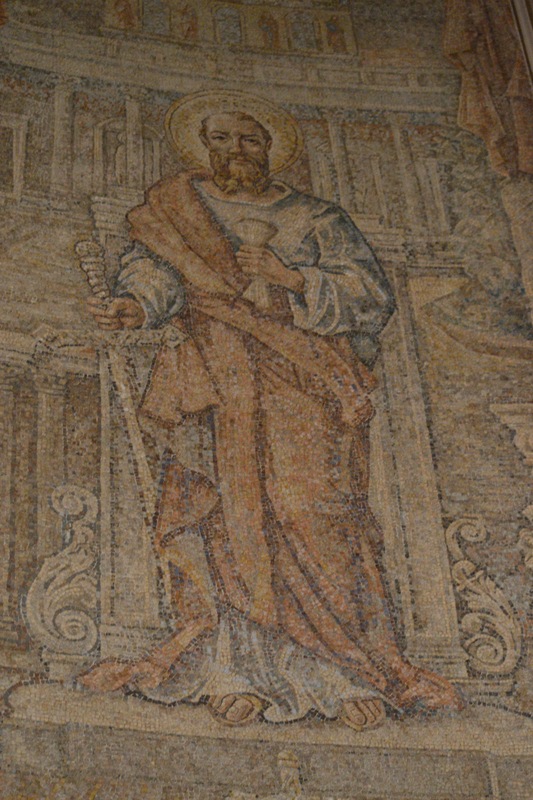 From marble mosaic on the Sanctuary wall at the Cathedral Basilica of Saints Peter and Paul, Philadelphia PA. In the background is Saint Peter’s Basilica, a major basilica in Vatican City, Rome. 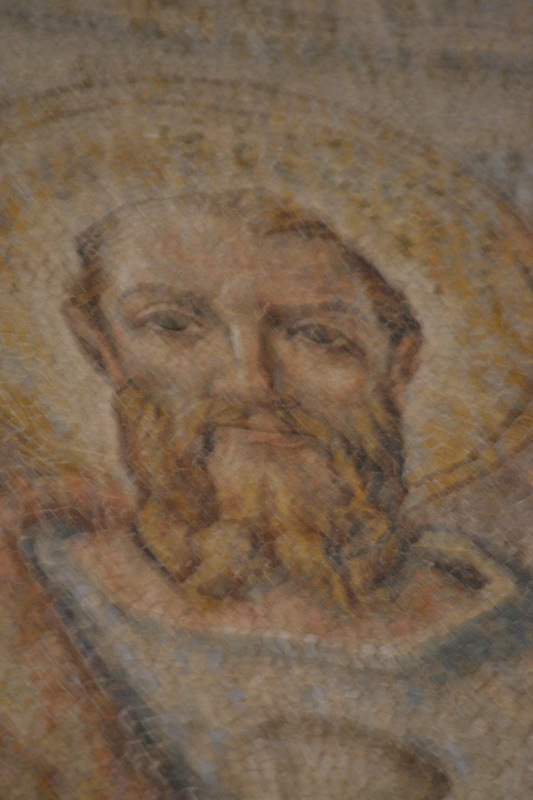 From marble mosaic on the Sanctuary wall at the Cathedral Basilica of Saints Peter and Paul, Philadelphia PA. In the background is Outside-the-Walls Basilica, a major basilica in Rome. The Assumption of the Blessed Virgin. 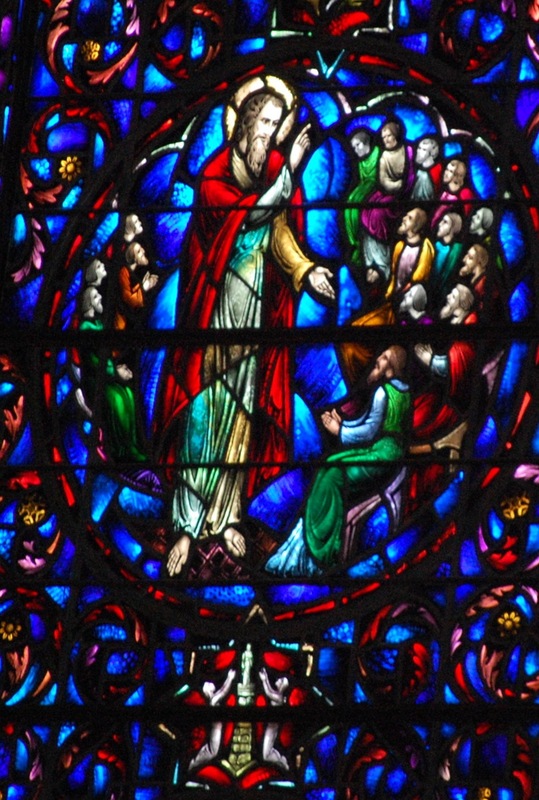 Inside the great dome, at the center, is Mary ascending into Heaven. Around Mary are panel paintings called the “Angels of The Passion. Within each group of angels is an emblem of the Passion; the cross, crown of thorns; twelve in total. 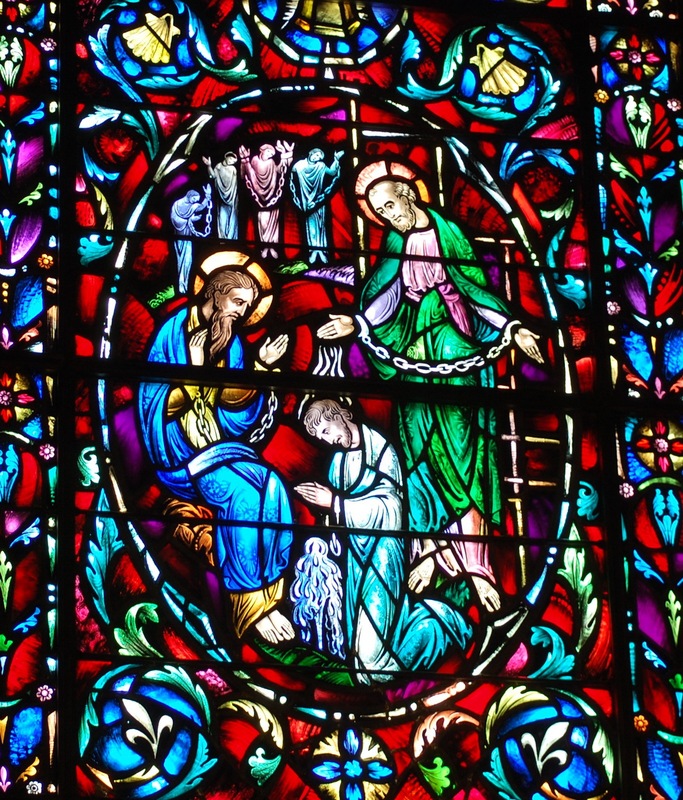 The stained glass windows, detail is not shown, are of Blessed Mary holding the Child Jesus, with Saint Peter and Saint Paul on each side. 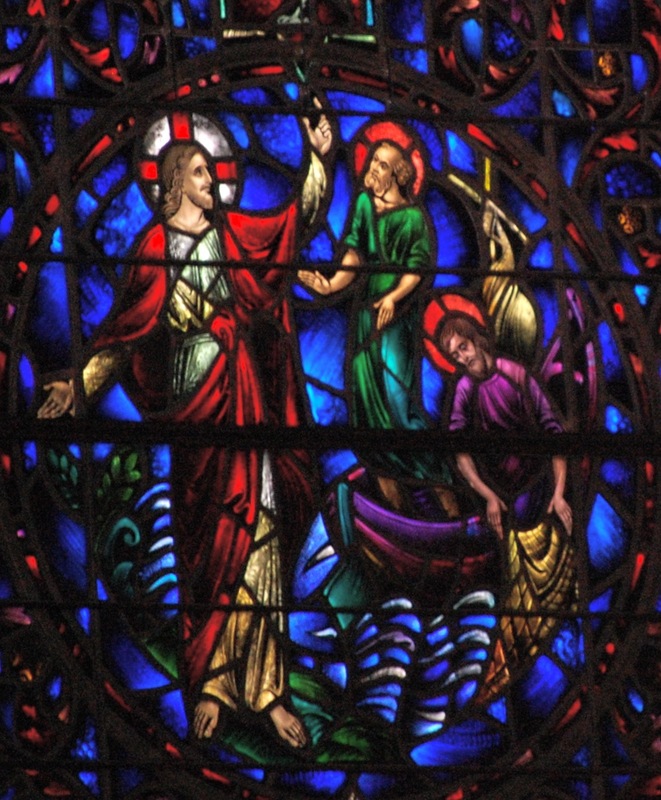 The remaining stained glass windows are Doctors of the Church, including friends of ShrineTower; St. Augustine and St. Basil. 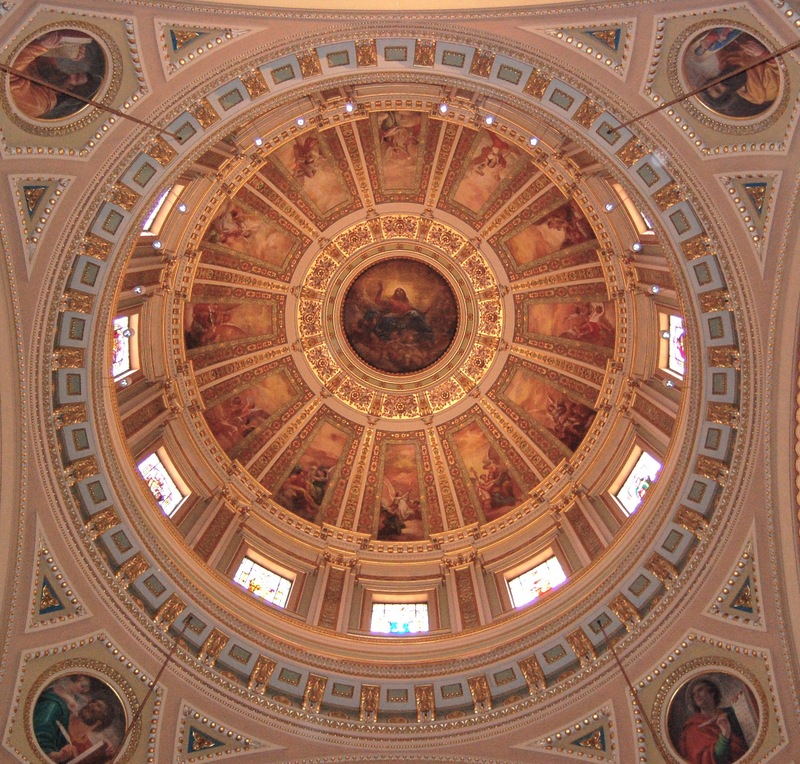 The four pillars of the great dome are the four Evangelists: Matthew, Mark, Luke and John. 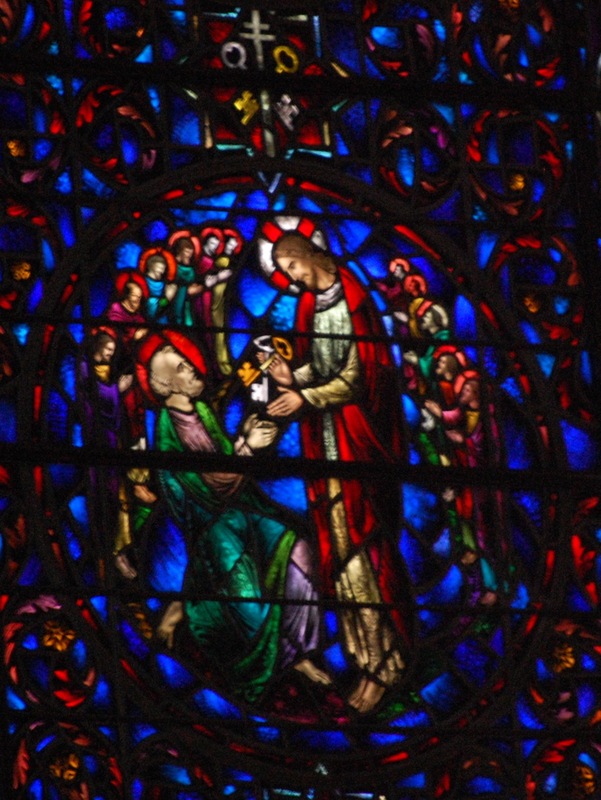 The Assumption of the Blessed Virgin (cont’d). 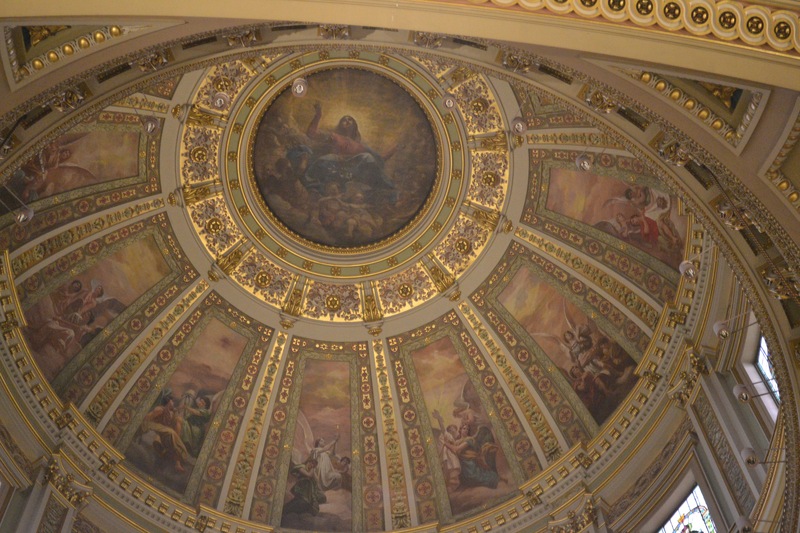 Closer view of the great dome of the Assumption of the Blessed Virgin. 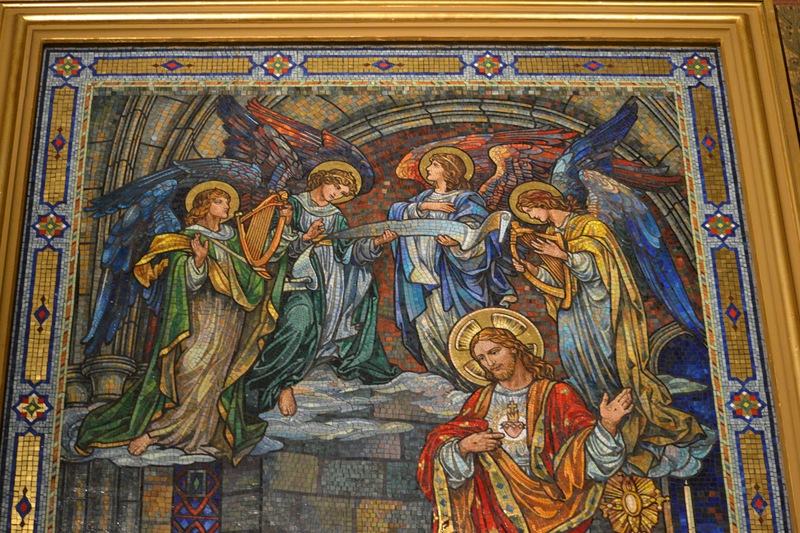 Several of the “Angels of The Passion” panel paintings can be seen. Mary Mother of God is the patroness of the United States of America. 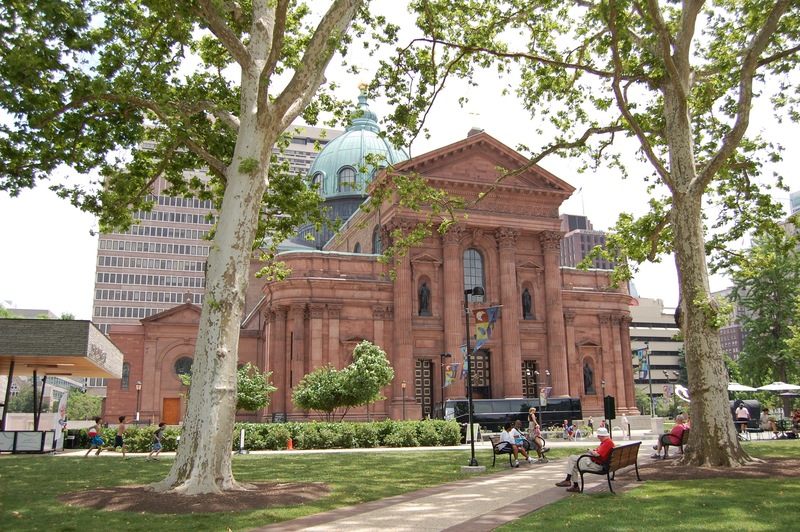 The Sacred Heart of Jesus is the patron of the Archdiocese of Philadelphia. 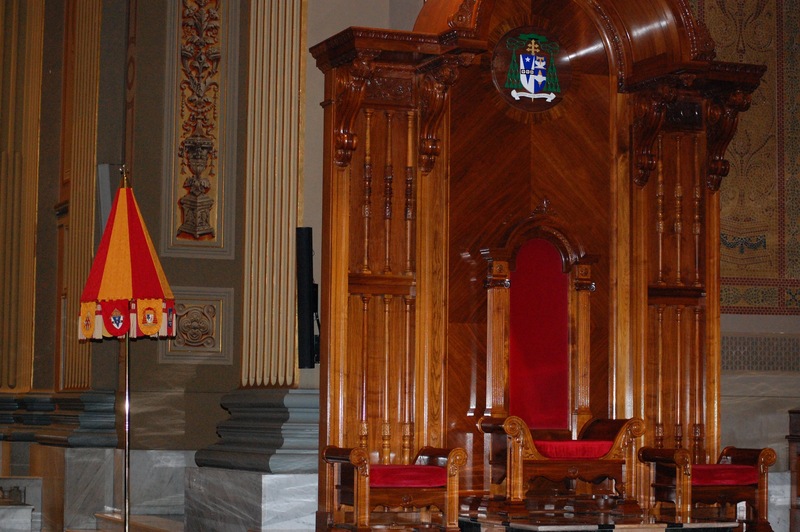 The umbralino in the Sanctuary next to the Cathedra or Bishop’s chair. Whenever a Pope visits a basilica, its umbralino is opened. 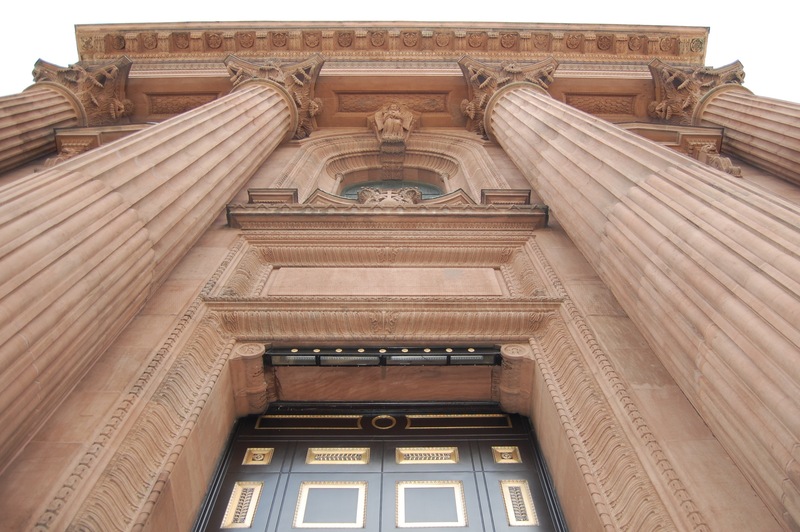 It was last opened on Pope Francis’s visit to Philadelphia in September, 2015. A small gold bell is hanging below an enamel plate with a picture of Saint Peter and Saint Paul. On the other side of the plate is a picture of the Cathedral Basilica. At the top of the tintinnabulum is the papal tiara and Keys of Heaven. 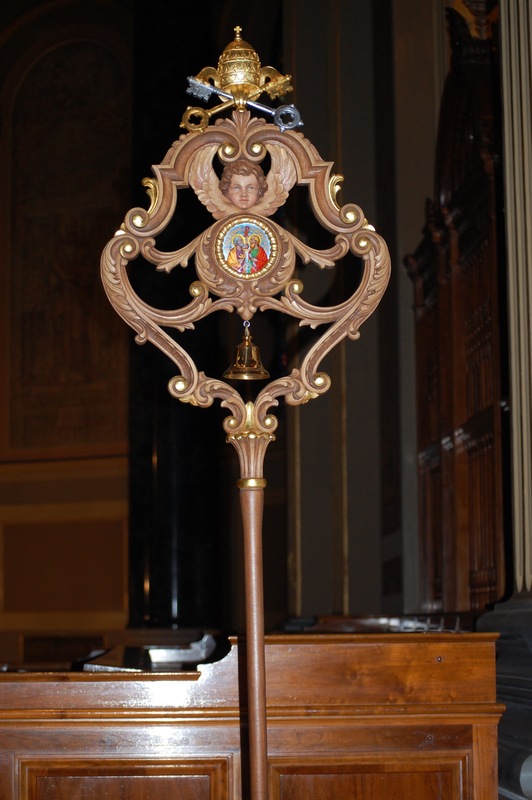 If Pope Francis were to celebrate the Mass at Saints Peter and Paul Cathedral Basilica, the tintinnabulum would be used to lead the procession down the Basilica’s main aisle. 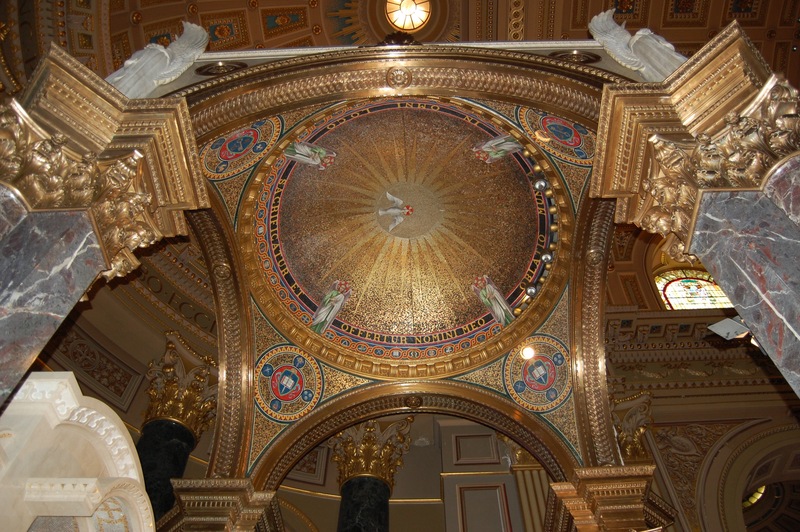 Ciborium – View Looking Up. 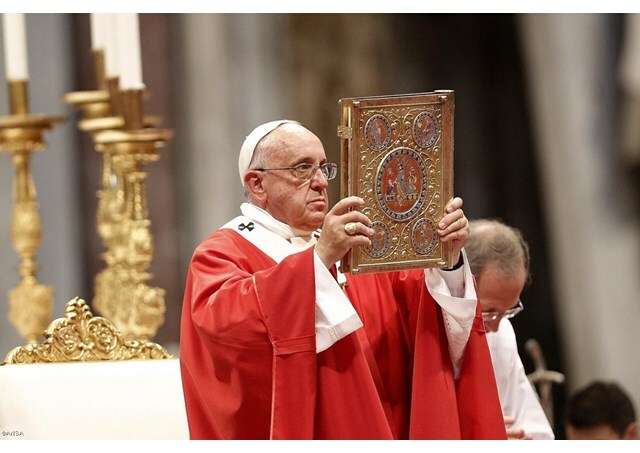 In the center of the underside of the ciborium is the Holy Spirit symbolized as a dove. The mosaic carries in Latin an inscription which translates: “In every place there is offered and sacrificed in My Name a clean oblation.” From Malachias 1:11. 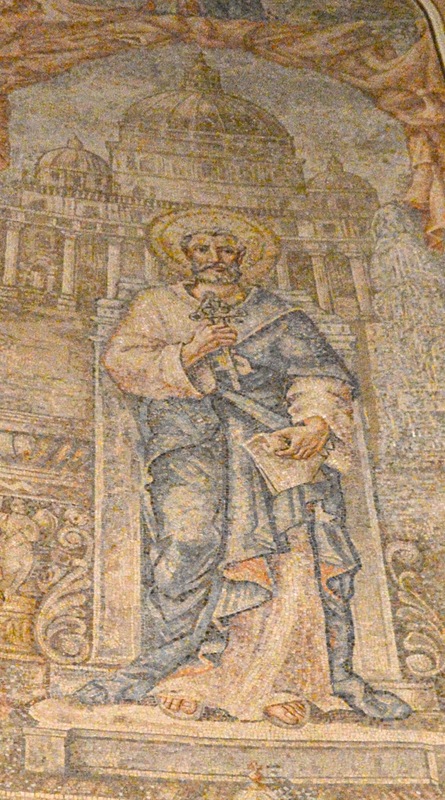 Paul Preaching to the Athenians (Pagens in Greece). 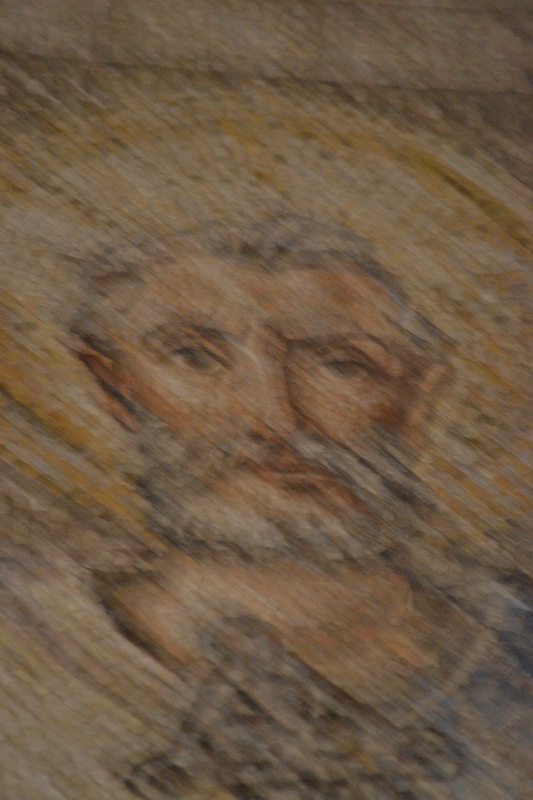 Paul was beheaded in Rome. 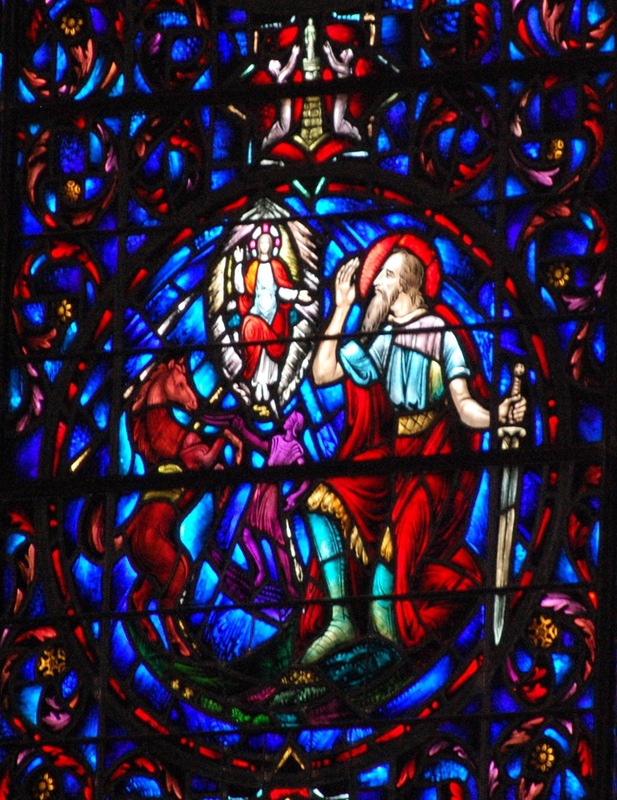 “These are the ones, who living in the flesh, planted the Church with their blood; they drank the chalice of the Lord, and became friends with God.” Entrance Antiphon, Feast Day Mass. 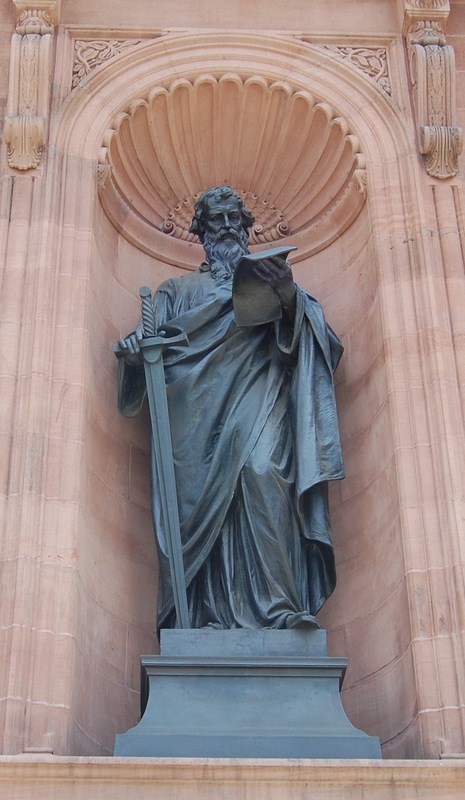 Saint Paul at the front entrance to the Basilica Cathedral of Saints Peter and Paul, Philadelphia Pennsylvania. 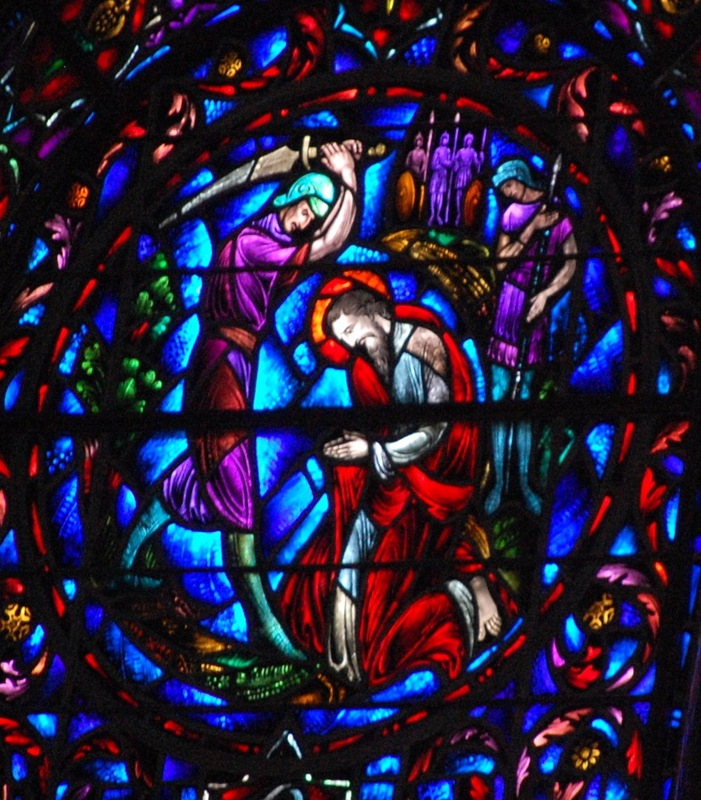 In Archbishop Chaput’s sermon on the Feast day Mass of June 29th at the Basilica, he said most people think of Paul’s symbol, the sword, for his martyrdom, since he was beheaded by the Romans. It really is the sword of the Spirit, the Word of God where the sword penetrates our heart. Jesus Giving Peter the Keys to Heaven. Peter Being Called by Jesus. 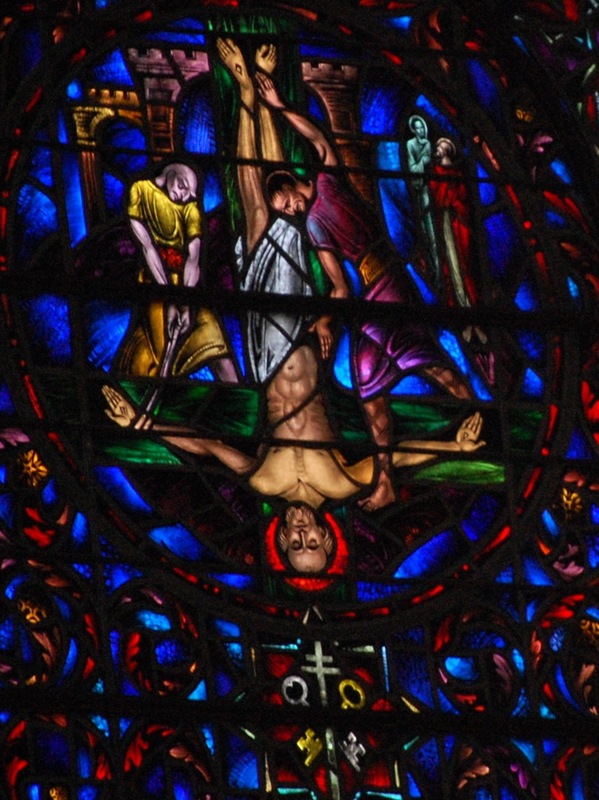 Peter was crucified upside down, at his request, according to Origen of Alexandria. 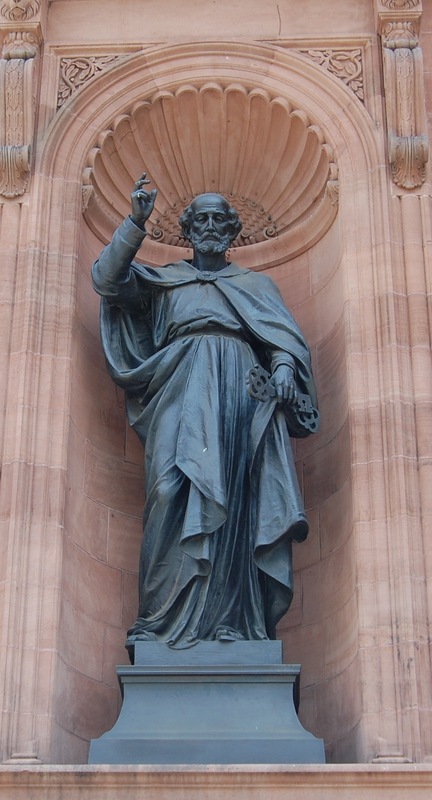 Saint Peter at the front entrance to the Basilica Cathedral of Saints Peter and Paul, Philadelphia Pennsylvania. Peter in chains teaching the other prisoners. Successor to St. Peter: Pope Francis. 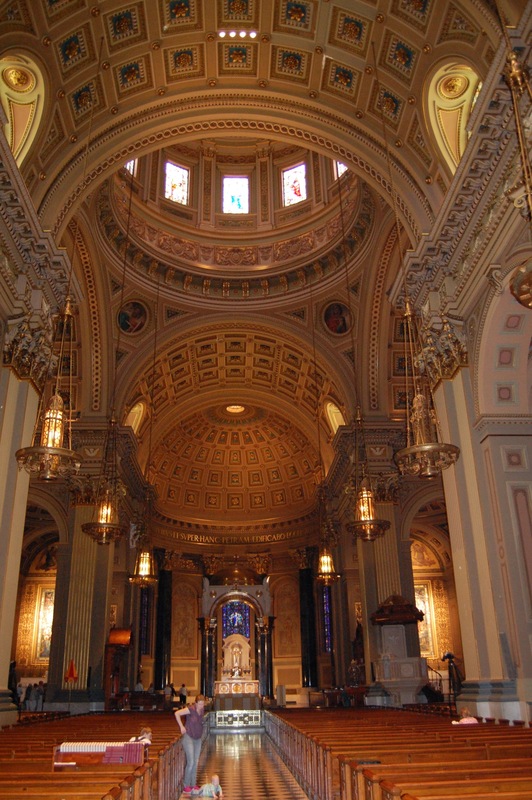 Cathedral Basilica of Saints Peter and Paul.